Scallops in Wine, Stuffed Pork Tenderloin, Main Courses for Nov. 15, easy recipes. Sweet scallops with a simple wine sauce. Scallops are best when cooked quickly over fairly high heat. Overcooking tends to make them tough. Slice shallot. Heat oil in a medium skillet. Add shallot and sauté until tender. Move to the side. Add scallops and quickly brown on both sides over high heat. Remove scallops, keep warm. Reduce heat and add paprika, chives, wine, stock and mustard. Stir well to scrape up the browned bits and the shallots. Stir in yogurt, return scallops to heat through. Serve. The stuffing: Chop mushrooms and mince or crush garlic. Heat 1 tbs olive oil in small skillet over medium heat. Add paprika and sauté for 1 minute. Add mushrooms and garlic and sauté for 3 - 4 minutes, until starting to brown and soften. When mushrooms are done put into a small bowl and add bread crumbs and basil; mix well. The pork: Butterfly pork tenderloin - cut it in half lengthwise leaving 1/4 inch intact along the edge, so that you can open it like a book. Open it and give it a couple of whacks with a meat mallet so that it lies flattish... or pound lightly with the edge of a plate. You just want it to be flat and easy to work with. Spread mushroom mixture on one side of pork about 1/8 inch from the edge. Fold other side over and tie with kitchen string. Cut five 6 inch lengths of string and wrap around pork and tie every 2 inches - making certain that you do one as close to each end as possible. The rest: In a small bowl whisk together remaining 2 tbs olive oil and vinegar. 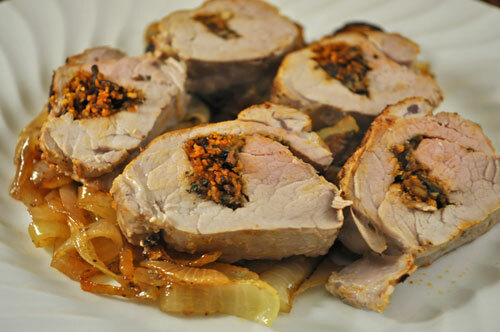 Place pork on onions in a small roasting pan and roast in 400F (200C) oven for 25 - 30 minutes, depending on size, until done, basting periodically with oil/vinegar mixture. When done, slice and serve. Pork should be slightly pink in the center to keep it moist. Slice it and take a peak or, best method, use a meat thermometer. Pork is done when internal temperature reaches 145F. Slice onion thickly. Heat butter in a nonstick skillet over medium-high heat. Add onions and sauté until tender, about 5 minutes. Add vinegar and brown sugar. Stir well to melt sugar and combine. Spoon onions into a small roasting pan, arranging so pork will just fit on top. Tomato Sauce: Cut chicken into small pieces, 1/3" (1cm) or less. Roughly chop tomatoes, reserving all juices. Heat 1 tsp oil in medium skillet. Add chicken and sauté until cooked through. Add tomatoes, all juices, oregano, basil, cover and simmer 10 minutes or until needed. Vegetables: Trim and chop mushrooms. Cut butternut squash into small pieces, 1/4" (.75cm). Trim leeks. Slice in half the long way and rinse well. Thinly slice, up to and including some of the pale green. Mince garlic. Heat 1 tsp oil in nonstick skillet. Add mushrooms, leeks, garlic, paprika and sauté until tender. Remove to a plate. Add remaining 1 tsp oil and butternut squash. Sauté until tender, about 10 minutes. Remove from heat. The Béchamel: In a medium saucepan heat the butter over low heat. Add flour and stir with a whisk for 1 minute. Add a little (1/4 cup) of the milk and whisk to combine. Turn heat up to medium and keep adding milk, a little at a time and whisking. You should have added all of the milk in a minute or 2. When all of the milk is in, bring to a boil (should almost be there), whisking. Then remove from heat and stir in yogurt. Cover and bake 425F (215C) for 20 minutes, or until noodles are done. Test in center with a sharp knife. Uncover, sprinkle with shredded cheese and bake 5 minutes longer to brown. Remove and let rest for 5 minutes. Cut into squares (or oblongs) and serve. Chop the onion. Slice the lemon and pick the seeds out of the slices. In medium nonstick skillet sauté the onion until tender. Move onions to sides of pan and sauté turkey cutlets until lightly brown on both sides. Add the chicken stock, wine and capers. Place the lemon slices on top of the turkey cutlets, cover, reduce heat and simmer 10 minutes. Remove turkey cutlets (with lemon slices on top) to a platter and keep warm. Stir in the cornstarch mixture and heat, stirring until thick. Serve cutlets with sauce on the side - sprinkle on more capers if you like. Clean, trim and slice mushrooms. Heat oil in nonstick skillet over medium high heat. When hot add paprika and sauté 1 minute. Add mushrooms and sauté 5 minutes longer. Move mushrooms to the side and add the ham slices. Brown lightly on both sides. Add coffee, sugar and bring to a boil. Remove ham to a small platter. Add cornstarch dissolved in water and stir until sauce is thick. Pour over ham and serve. This is closer to the traditional recipe one often finds in cafeterias in the US. I've updated the flavors, used ricotta rather than cottage cheese and the peppers are cooked, but not overdone. 3 small or 2 medium nicely shaped bell peppers, any color 4-sided peppers work best. Cook rice in stock until done, about 15 minutes, or according to package directions. Peppers: Put a large pot of water on high heat and bring to a boil. Cut peppers in half the long way (try to find the best flat sides before cutting so that they will lay nicely) and remove stem end and seeds. When water is boiling drop peppers in and simmer for 5 minutes. Remove (use tongs) and put into a baking dish that will just hold them (if possible). Stuffing: Chop onion, celery and garlic. In nonstick skillet heat oil over medium-high heat. Sauté chili powder for 1 minute. Add garlic, celery and onion, sauté until tender, 5 - 7 minutes. Add beef and sauté until cooked through breaking it up as it cooks. Add 2/3's of the tomato sauce, Worcestershire sauce, basil. Heat through. Add ricotta and rice. Remove from heat and spoon mixture into the pepper halves. Cover with foil and bake for 15 minutes at 400F (200C). Slice cheese. Remove foil from peppers, spoon remaining tomato sauce over and top with cheese. Bake, uncovered for another 5 minutes. Remove from oven and serve. Note: If the stuffing doesn't fit, keep it warm and serve on the side or just eat it right now out of the pan.